Mumbler has teamed up with Stray FM to promote exciting new offers for local families. Get an exclusive additional 10% discount on the Stray FM vouchers with Mumbler. Get an ADDITIONAL 10% off the already half price Family Ticket by using our exclusive discount code Mumbler10. Book here. Invitations have been sent out for the Fairy Godmother of all Pantomimes Cinderella and you’re all invited! 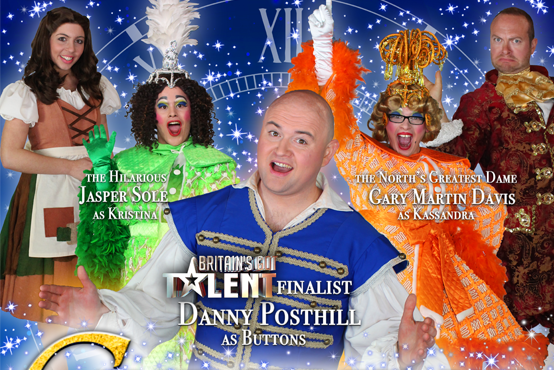 This Christmas, Leyburn in North Yorkshire will be awash with seasonal festivities and the star at the top of the Christmas tree this year will be the Norths own comedy Tour de force Danny Posthill. Impressionist Danny is widely acclaimed as one of the world’s best comedy impressionists. Danny a finalist on Britain’s Got Talent was an instant hit with audiences and judges alike with Simon Cowell saying “The act was great, you’re funny. You’re good… I like you”. Amanda Holden “It was just effortless” and David Walliams “Brilliantly funny”. Huge accolades indeed but if you think this is the only reason to come join us this Christmas then you would be mistaken as the show features an original script that has more laughs then a Christmas special with Morecambe and Wise. This reimaging of a classic tale will, have you rolling in the aisles, with a set designed by the Great British Panto Awards best-set winner Harrogate theatre and to boot, costumes designed by award-winning designers. (just off the A1) from the 18th-30th December. Full terms and conditions are available on the Stray FM website.